At North Western Models we believe that it’s the detail that brings a model railway to life. North Western Models was established in 2015 by Kevin Colley and Christopher Gore as an online model shop based in Stockport, Cheshire. Initially dealing with high quality detailing accessories and kits, North Western Models prides itself in serving the model railway community to promote the notion that detailing helps to bring a model railway to life. Both Kevin and Christopher have a lifelong passion with railways in general and also with model railways. Between them, they have planned, built and exhibited a number of layouts in 00 and N gauge at various local model shows. 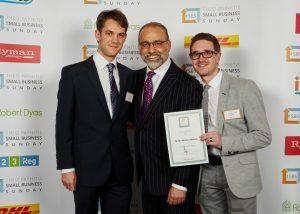 Kevin and Christopher receiving their #SBS award from Theo Paphitis. In February 2017, Kevin and Christopher were successful in being hand picked by Dragons’ Den star, Theo Paphitis, as a winner of his Small Business Sunday (#SBS) award. #SBS recognises, supports and champions small businesses within the UK that have achieved significantly since their establishment and work tirelessly to grow and move forwards. In at the end of October 2017 Christopher made the hard decision to move away to pastures new, with exciting new opportunities on offer, and as such has now left the business. With this development, Kevin made the decision to keep the business going, as it has gained much momentum and recognition on the local exhibition circuit in the past 2 years. Kevin would like to express his greatfull thanks to Christopher for everything he has done since the business started, and best wishes and good luck with everything in the future.